Introduce your students to the Literary Elements with this power point presentation. Characters of a story are introduced and whether they are protagonists or antagonists or round or flat. The setting is introduced as is the plot of the story. The students learn that the plot consists of the exposition, rising action, conflict, complications, and the resolution. The power point is complete with sound effects to engage your students. Help your students create a study sheet with this graphic organizer. 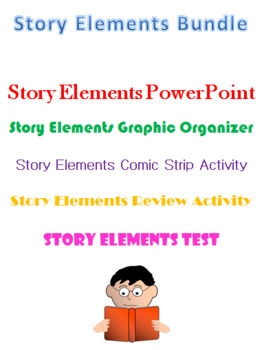 The graphic organizer covers each of the story elements and the specifics of each area. It can be used in conjunction with the Story Elements PowerPoint listed in my story. This activity will have your students putting your knowledge of story elements to the test as they create a 6 frame comic strip. They will follow the link in the activity to an online website that will walk them through creating their comic strip. A rubric is included for grading purposes. I used this as an assessment at the end of our unit on story elements, but it can also be used as a practice tool. This worksheet will help your students review what they know about the story elements. The activity includes a Magic Square to have students self check their answers. This is can be used as a follow up to the Story Elements PowerPoint listed in my store. 3. a short story to write asking the students to include the story elements in it.